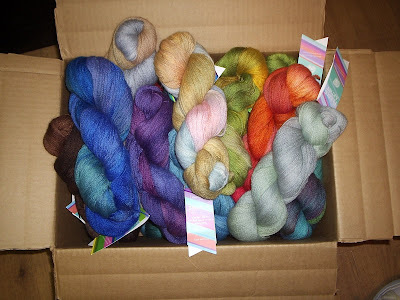 Herman walked in the door today with a big box full of a gorgeous new yarn, Fleece Artist’s Suri Blue. It’s 50% Suri Alpaca, 50% Blue Faced Leicester Wool. Elizabeth Freeman used this yarn to knit the stunning Laminaria Estonian Lace shawl that’s featured in the current issue of Knitty. Be sure to have a look, this one’s a beauty.